If you've ever bought or sold used trucks, prime movers, or even trailers, you know there's a lot at stake. If you're dealing with larger quantities or entire fleets, there is huge financial investment involved. Understanding what influences prices will give you a better idea of transport equipment's true value, and help you make more informed business decisions when it comes time to buy or sell. Just like commodities in any other market, the laws of supply and demand affect truck prices. As demand goes up or supply goes down, prices rise as businesses compete for available vehicles. Conversely, if the market is saturated with a particular type or model, buyers have the advantage. Consider looking for trucks-or buyers - outside your local area to take advantage of favourable conditions. These factors probably have the greatest impact on used truck prices. In a slow economy, people are less willing to pay higher prices, or aren't afraid of lengthy negotiations to get a price they want. And more companies sell their under-utilised fleets, making it a buyer's market. Industry cycles and seasonality - dictating which kind of transport equipment is needed at different times in different areas of the country or the world - can also influence prices. Well-known name-brands often command higher prices. People have had good experiences with them and trust them, or the name itself often simply implies a certain level of quality. But lesser-known and possibly less expensive brands may perform just as well. Having access to detailed information and being able to compare models side-by-side better helps buyers determine value. Age is an important factor in determining price. Generally, trucks depreciate as they age - they put a lot of kilometres on the odometer, show signs of wear and tear, need more repair and maintenance, or simply become out-dated by newer, more efficient vehicles. And two identical trucks of the same age can vary widely in price - one that's well-maintained or has low kilometres can be worth considerably more. Sometimes, a company's reputation can "follow" the trucks they sell. This can be good or bad. If vehicles come from a reputable organisation that's known for buying good-quality transport equipment and taking good care of it, buyers will often be willing to pay more for it. If it's equipment that's been owned by a company with a reputation for cutting corners, or it comes from a relatively unknown company, people can perceive it as a "riskier" purchase, and will offer a lower price. One of the best ways to gauge pricing trends is to use a resource that allows you to search a variety of equipment with current and historical selling prices. Create a free account on Ritchie Bros. website, and access equipment auction results from the past two years. As the world's largest industrial auctioneer, Ritchie Bros. conducts hundreds of unreserved public auctions each year, selling a broad range of used and unused equipment and trucks. 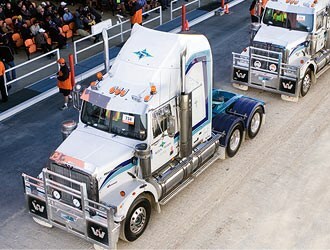 Ritchie Bros. conducts regular auctions at its permanent auction sites in Brisbane, QLD and Geelong, VIC. For upcoming auctions, equipment inventory and more, visit rbauction.com.